The girls' pea coats you see hanging in stores today are a far cry from the plain navy-colored wool versions originally worn by sailors in the early nineteenth century. Pea coats or pilot jackets first appeared in the late 1800s. They were originally designed for European servicemen and featured double-breasted fronts, large wooden or metal buttons and broad lapels. Military-style pea coats were made from wool and known for their large vertical or slash pockets. Today, the conservative coats have been revamped to reflect an edgier look. Girls' pea coats still maintain a classic style, but they also feature updated colors, fabrics and embellishments. Girls' coats are a wardrobe essential. They can be dressed up or down according to the occasion. Most pea coats for girls feature double-breasted styling and peaked lapels. However, designers have now included a girlish twist to the classic coats, so that mini fashionistas can stay warm and look stylish at the same time. Old Navy: The popular children's store offers pea coats for girls in black and red. They feature the traditional notched collar and double-breasted front. Roxy: Roxy features a traditional pea coat for girls with a fashionable twist. The After Party Fleece Pea Coat is made with warm fleece fabric instead of the classic wool. It's also detailed with a cool collar, two-button closure, two pockets, cuffed sleeves and a Roxy logo sitting at the hip. Chasing Fireflies: This clothing store carries one of the cutest pea coats. It features an A-line cut with slanted pockets and a satin lining. It's also machine washable. Gap: The trendy kids clothing franchise offers several styles of pea coats for girls, including a unique pea coat cape. The advantage of shopping for girls' winter coats online is that the selection is exponentially larger than you would find at most department stores. The downfall to purchasing pea coats via the Internet is that you don't have the ability to have your daughter try on the garment before you pay for it. Measure your child, and then check the website's size chart before ordering. This will help save on returns. Read the website's return policy carefully. At many sites you are responsible for the shipping on returns. 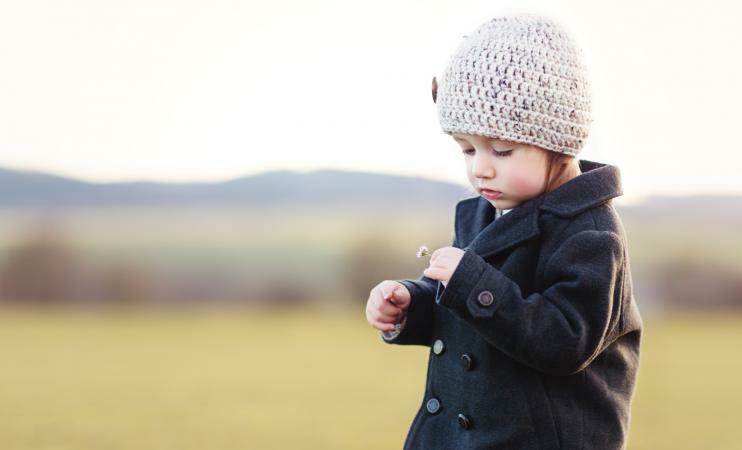 Before removing the coat's original tags, have your child try on the pea coat with garments she plans to wear under it to insure a proper fit. Pea coats for girls should last through a couple of winters, and may even make it as a hand-me-down for younger sisters. When buying pea coats online, read descriptions carefully to determine the type of closure, such as toggles or buttons as well as washing instructions. Kids' coats should be easy to put on and take off. In addition, they should be functional as well as fashionable.